The Bohemian gem of Eastern Europe, the centuries-old buildings, the quirky art, the tasty beer…these are just a few of the reasons Prague makes such a great destination for travelers. With so much to see and do, you could spend your entire vacation exploring Prague, but many people choose to spend a few days there in addition to visiting other cities in Eastern or Central Europe. 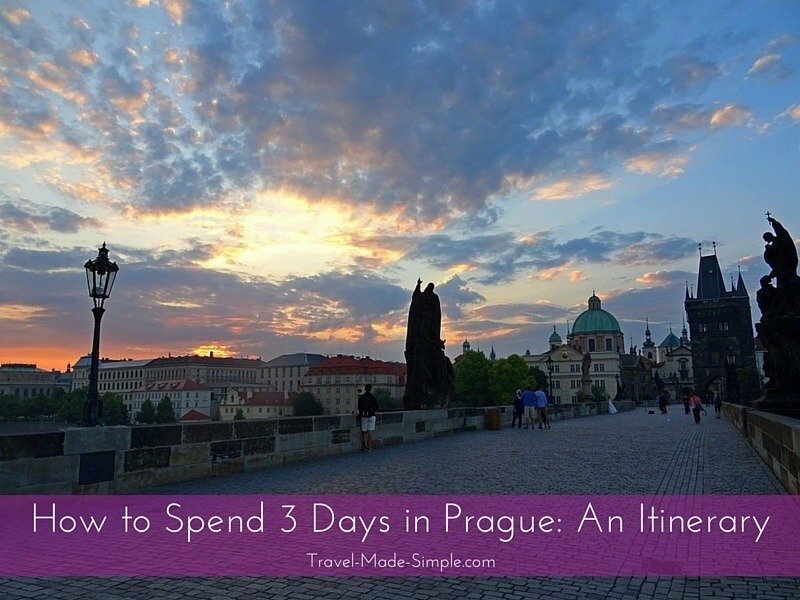 This Prague itinerary will show you what to do in Prague in 3 days, or even 4 or 5 days. 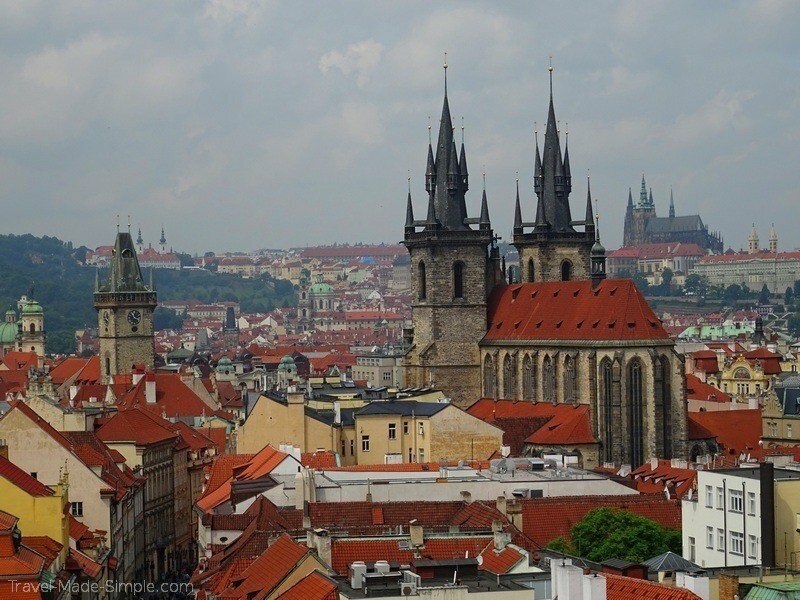 Do you have 4 or even 5 days for Prague? 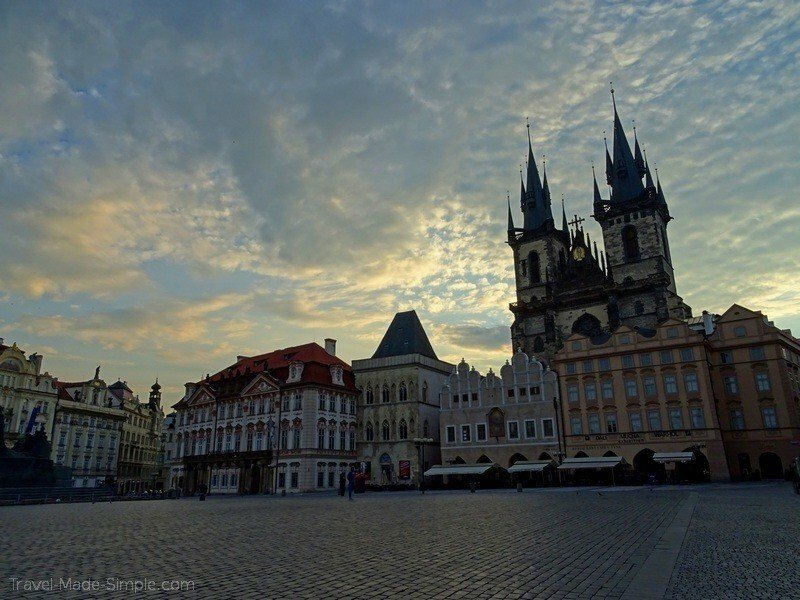 The center of Prague is Old Town Square (Staromestska namesti). This where you find the iconic picture of the town of the spiky topped Church of Our Lady of St Tyn across from the Astronomical Tower. This square is filled with a Christmas Market or Easter Market in the right season. The rest of the year it is just filled with people and a handful of food stalls. You can take an elevator to the top of Town Hall tower, but save that for tomorrow. Start your Prague trip here. Try to ignore the throngs of tourists and the hawkers trying sell everything under the sun or that there is a Starbucks on the square. Try to look at the city as a center of culture and science with a well preserved skyline of spiky towers, medieval cathedrals, and Victorian age buildings. From the square, you can get to all of the big sights in Old Town. Wenceslas Square is an enormous long square lined with retailers that you can find nearly anywhere in Europe, capped with the National Museum. This is the center point of much of the revolutionary history of the city. The Velvet Revolution began here. Josevov is the Jewish district in the old town of Prague. There is a cemetery and the Old New Synagogue as well as a museum. You can walk it on your own or book a guided tour. Walking and wandering around the old town area is a lot of fun. There are a lot of little winding streets and tiny hidden squares to find. As mentioned in the “where to stay” section below, Prague’s center has embraced commerce and tourism completely, so be aware of that. Hopefully the new law banning Segways will help. Czech beer is a wonderful thing and is very steeped in the history of the place. We took a Prague craft beer tour, and it really was the highlight of the trip. And the best part is that it starts at 5pm, so it gives you almost the whole day to go sightseeing and know that there is beer in your future. There is enough food on the tour to not be too drunk and not have to worry about dinner. Book the Prague craft beer tour here to taste some of the city’s best brews, along with some delicious Czech food. In almost every city we visit, we book a food tour. Food tours give you a look at the food and a list of places to try right off the bat. It also gives you a bit of the history as well. Check out our review of the Eating Prague food tour here. The food tour we did started at 12:30, so gives you some time to see things in the morning. The food tour runs until late afternoon, so you have time after it to do a few more things. You will probably want a light dinner anyway and walking off the food can be good. Book the Prague food tour here and learn about the city’s tasty cuisine. The Old Town Hall Tower is open from 11am until 10pm, so makes a good stop after the tour. And it has an elevator, so no worries about walking steps on a full belly. 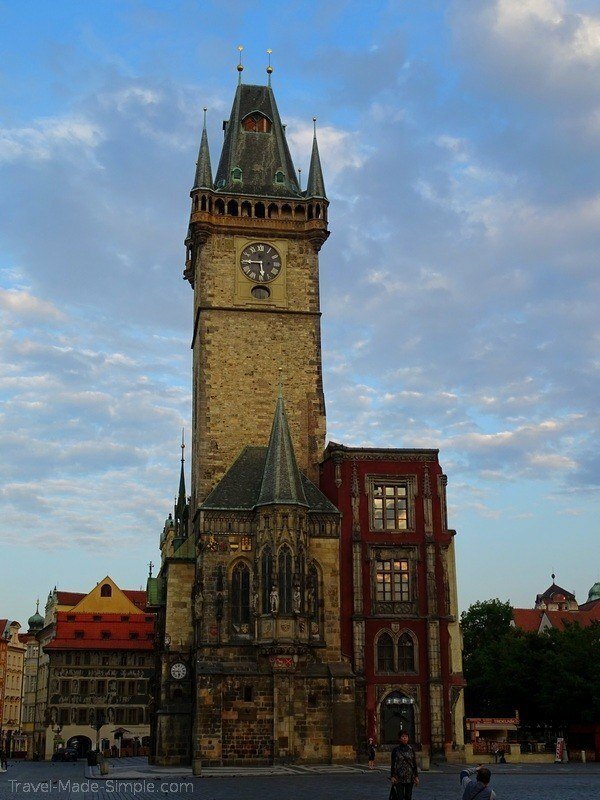 See more details on our post about towers in Prague to climb. If you really aren’t into a food tour, or want a more active tour, check out this bike tour of Prague. The typical approach to Castle Hill is a long upward sloping road lined with tourist shops to the cathedral-crowned, fortified hill of Prague Castle. To get there from old town, cross Charles Bridge and make your way upwards. Charles Bridge is a pedestrian only bridge that crosses the Vltava River. The spiked towers on either side were used as models to rebuild several of the other towers in town during the Victorian era. This is definitely a worthwhile site to stroll over. Be aware that in the high season it will be quite crowded. Even at sunrise (5am in June), we were not alone on the bridge, though there were far fewer people that early. There are usually peddlers of art and musicians during the day. Prague Castle is a fortified hill with several different things to take in. You do have to pay to get onto the premises, but the ticket lasts for two days. Buy a skip-the-line castle ticket here. Highlights of the hill include St Vitus Cathedral, whose towers dominate the skyline of the hill, and you can climb one of the towers. There are also several exhibits about the history of the castle, and the palace buildings. A row of old low houses called the Golden Row once housed the city’s famous author son, Franz Kafka. There are other interesting things on this side of the river as well. Just north of the end of the Charles Bridge in the courtyard of the Kafka Center are a pair of bronze statues peeing into a pool in the shape of the Czech Republic. The statues were made by David Cerny, one of Prague’s most famous artists. If you see something odd around town, he probably made it. Check out 10 bizarre sculptures by David Cerny that you can find in Prague. Just south of the end of the bridge is an area worth a wander. The Lenin wall is there as well as some of the better views of the bridge itself. Petrin hill is the hill you see across from the tower with what looks like a mini Eiffel Tower. You can get to the top of the hill with a funicular, but you will have to walk up the stairs if you want the view from the tower. 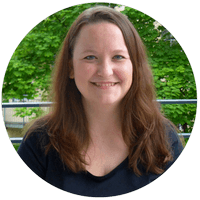 Have 4 or 5 days in Prague? If you have more room in your Prague itinerary, here are a few more things you can do to explore the city. The ticket to the Castle Hill lasts for two consecutive days, so you can explore it for a second day. It’s also worth exploring one of the other neighborhoods, like Prague 2, south of center, or Prague 3, east of center, if you have extra time in the city. Though primarily a city known for big architectural sights, there are museums in town to go through as well. Check the websites if you are interested. Most of the museums are closed one day a week, usually Monday. A few are closed in the winter. The City of Prague Museum near the Florenc Metro station has exhibits about the history of the city, with maps and models in some exhibits. The National Technical Museum has exhibits of science and technology and is north of old town on the other side of the river. The Jewish Museum in Prague shows the life of Czech Jews through the years. A Public Transport Museum is run by the public transit company in one of their depots. The Mucha Museum is worth it if you like the art of Alphonse Mucha, but is probably a bit expensive for its size if you aren’t an art fan. The Anton Dvorak museum might be more your speed if you are into classic music. This is part of the National Museum complex of buildings. The main building is on Wenceslas Square and is under renovation for several years (as of June 2016). The Charles that built the Charles bridge also built Karlštejn Castle out in the countryside and it’s within day trip distance. There are regular trains from Prague to the station at Karlštejn and take 45 minutes. Then Google says a 30 minute walk, though it is steep, from there to the fantastic looking castle. Kutna Hora is doable on your own if you want, but there are some guided tours if you want the logistics taken care of and a guide for some information. This charming medieval town is a bit farther – about 3 hours from Prague by train – and might be better as an overnight trip. But if you don’t have enough time for that, it’s still totally worth it as a day trip from Prague if you get an early start to your day. The city is a UNESCO World Heritage site with an impressive castle dating back to 1240, and you’ll enjoy wandering through the streets and alleys of the old town. If you don’t want to deal with logistics on your own, consider taking this guided day tour. Summer is the high season. This is when you’ll see the most tourists (and stag parties) and experience the best (if hot) weather. Spring around Easter can be nice. There are Easter markets in a lot of the squares. Winter can be very cold and blustery. Snow is apparently rare, but not unheard of. The wind though can be brutal. On the up side, there are Christmas markets in a number of squares and far fewer people around. Prague is a big city and doesn’t ever close its doors. Prague numbers its districts, with Prague 1 being the old town. Prague 5, 6, and 7 are across the river from the old town. Even still there are plenty of things out from the center to see. There is good transport in the city with 3 subway lines and a set of trams. Even still the transport doesn’t go through the main square. The bulk of tourist activities are in the center, but this also means most of the restaurants and such are oriented at tourists as well. Prague has taken to being a tourist destination and the center shows this. The center can be loud with many bars. The main avenues of foot traffic run from the Powder Tower through old town square to the Charles Bridge (Korluv must) and from old town square to Wenceslas Square. There are plenty of little winding streets in the district as well. Look for side streets if you want to stay in this district, but even still don’t assume it to be quiet in the summer. The area around Namesti Republiky/Powder could be a better choice with a Metro stop if you plan to do a lot of things beyond just the old center. Prague 3 extends north east of the main station. This area is called Vinorhady and is less of a tourist destination, while still having plenty of restaurants. The main artery is Vinorhadska road, which also mirrors the metro line. Definitely look for a place not far from the metro or one of the tram lines so you can get around easily. Prague 2 extends south from the old town. Again a less tourist-ed, but still lively, part of town. There is a metro line and several tram lines into the center. Click here to book at the Czech Inn or click here to search for hotels in Prague. Transport in Prague is really good. There are subways and trams, both served by the same set of tickets and sold by time. You can buy a 30 minute ticket, roughly similar to a “single ride” ticket, up to a 24 hour ticket and several levels in between. There are machines in the Metro stations to buy tickets, but they take only coins. Hit up a tobacco shop to buy things with bills. Just remember to stamp the ticket in one of the yellow machines before you use it for the first time. A 24 hour ticket costs 110 Kc and is a great deal if you are moving around the city. It means you can hop on and off transport without worrying about tickets for that day. It is also literally 24 hours from the moment you stamp it, not just that calendar day. So a ticket bought at noon one day will still be good in the morning the next day. Find more info on the Public transport website. Prague’s airport is well connected to other parts of Europe and the rest of the world. Chances are you can find a flight from your home airport, even if you have to make a connection somewhere. There are also bus options that can be quite cheap. It’s always best to compare options to find the one that best fits your budget, time frame, and comfort level. Try booking trains, buses, and flights all over Europe using Omio (formerly GoEuro). It’s straightforward and all in English. 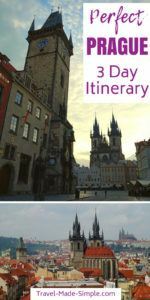 Hopefully our Prague itinerary and ideas for planning three days in Prague have been helpful. 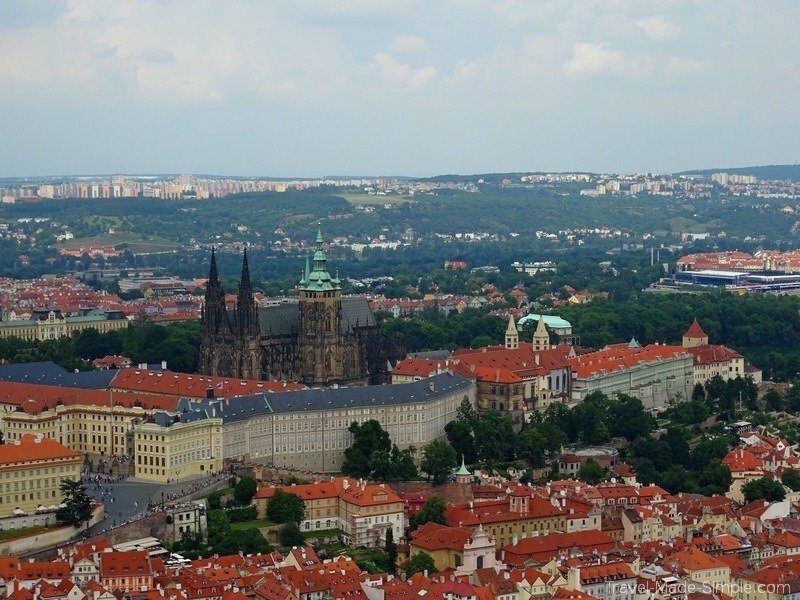 The following posts provide more in-depth information about Prague travel and tours in Prague. And if you’re looking for a little inspiration, be sure to check out the books and movies recommended below. Thanks! Sorry to make you sad, Henry! It really is an amazing city though. I’m glad we live less than 5 hours away and can easily go back again. I hope you get there again some day! I’m planning to visit Prague in mid-oct as a solo traveller but I am afraid i may feel alone too much instead of having adventures and getting to know the people, so do you have any recommendations? Hi Haneen! When I travel by myself and don’t want to be alone the whole time, I usually look for day tours. It’s a good way to enjoy the city and meet other people, even if it’s just for a few hours. If you like beer, I really enjoyed this craft beer tour in Prague. I also took this food tour in Prague and it was quite good. You can look for more Prague tours here and see if anything sounds interesting to you. If you’re staying at a hostel, they usually organize activities or can recommend tours. I always bring my Kindle to meals when I’m on my own so I can read. If you’re eating at a place with a bar, consider sitting at the bar because it’ll usually give you the opportunity to chat with the bartender or other people sitting there. 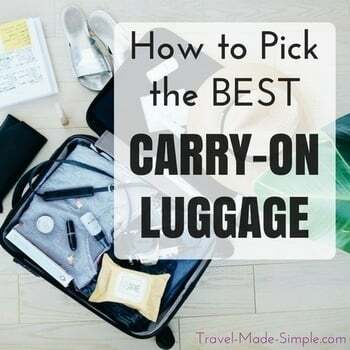 I hope this helps, and I really hope you enjoy your trip! Ali, how is it to travel in Prague as an english speaker only when you plan your own itinerary and not use a travel agency? Hi Kelly! I think you’d be fine. I’ve never used a travel agency to go there, always set up my own itinerary with a few food tours and it’s been great. Most people, especially in touristy areas where you’re likely to be, will speak decent English. They’re very used to tourists. Let me know if you have any other questions! Prague is beautiful, I hope you enjoy it! Hi Lito! I don’t have experience with a full package tour for Prague, but I suggest checking here for day tours in and around Prague. Also, I really enjoyed this food tour in Prague and this craft beer tour in Prague.